Posted by John P. Mello Jr.
BlackBerry's Q10, the company's new smartphone with a QWERTY keyboard, is finally appearing in U.S. retail channels. AT&T is the latest carrier to start taking pre-orders for the phone. Orders for the Q10 on AT&T began Wednesday, with an expected shipping date of June 18. Like rival Verizon, AT&T charges $199.99 for the handset with a two-year agreement. Verizon announced Wednesday that it would start selling the Q10 online on June 6 and that the unit will be in its stores on June 10. T-Mobile sells the smartphones under its installment plan. You'll pay $99.99 at time of purchase and $20 a month for 24 months. If you terminate service with the carrier during the two-year period, you'll be tapped for the outstanding balance for the phone, which sells for $579.99. Sprint says it will launch the Q10 this summer. In addition to its QWERTY keyboard, the Q 10, which runs the company's latest BlackBerry 10 operating system, has a 3.1-inch super AMOLED screen with a resolution of 720 by 720 pixels, 2GB of RAM, a dual-core Qualcomm processor, and two cameras--a 2MP front-facing shooter and 8MP rear-facing one. Last month, TechHive rated the Q10 a three out of five on its scoring system. The review said: "It's a solidly built piece of hardware that will please those who've waited for a new physical-keyboard BlackBerry, but the Q10's small screen and limited app support will keep many away." 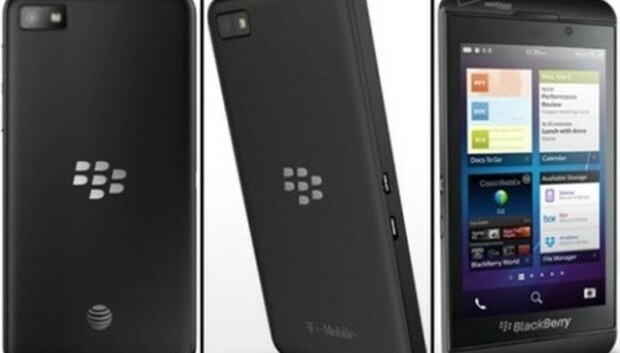 The U.S. carriers have carried BlackBerry's full-screen smartphone, the Z10, since March. Although available in other parts of the world since February, it has taken longer for the Q10 to make it to the states , primarily due to the rigid testing requirements of some U.S. carriers. Although the Q10 has yet to get into the hands of consumers, it has been in the hands of U.S. corporate types for some time. BlackBerry said Wednesday that 60 percent of U.S. Fortune 500 companies are using or testing BlackBerry handsets, including the Q10. Just as the Q10 makes it into U.S. retail channels, news about the next generation of BlackBerry phones begins to appear. The Canadian company plans a holiday season launch of a new keyboard-less model, the A10, which will be a premium smartphone, according to Cnet. Sprint, which chose not to carry the touchscreen-only Z10, is reportedly ready to embrace the A10, which will be unveiled in November. Citing a person familiar with Sprint's plans, Cnet noted that Sprint passed on the Z10 because it got a peek at the A10 and decided it was worth waiting for. Not only will the A10 get an updated version of the BlackBerry operating system, Cnet said, but it may see design and build improvements.